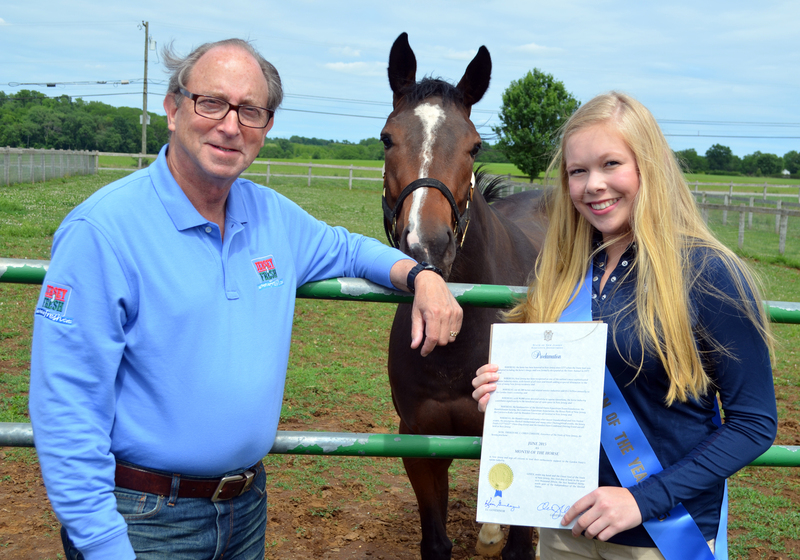 (TRENTON) – New Jersey Secretary of Agriculture Douglas H. Fisher and New Jersey Equestrian of the Year Kirsten Jeansson today kicked off June as the Month of the Horse in New Jersey with a visit to Hidden Acres 4-D Farm in Burlington County, a thoroughbred breeding facility. New Jersey is home to thousands of pleasure horses, show horses and race horses. In 1977, to honor the important place horses play in New Jersey’s economy and quality of life, the horse was named the official State Animal. To honor the state’s equine industry, Governor Chris Christie has proclaimed June the Month of the Horse in New Jersey. Kirsten Jeansson, a Seneca High School student from Tabernacle, was named New Jersey Equestrian of the Year by the New Jersey Equine Advisory Board in January. Her duties include attending functions hosted by the New Jersey Equine Advisory Board and represent the Board at functions.